All wildlife requires food, water, and cover, and can only live where these requirements are met. An ideal landscape uses native plants, and non-native, to provide a year round food supply – such as berries, fruit, seeds, and nuts. Water is essential for wildlife, and your water source can be as elaborate as a pond with a waterfall or as simple as a dish of water. Cover needs to be provided for wildlife to breed, nest, hide, sleep, and feed. Many native plants that provide food also provide cover. Dense evergreen trees or shrubs (such as yaupon holly or Walter’s viburnum) or thorny shrubs, such as blackberries, are perfect cover, as well as a food supply, for a variety of wildlife. Dead trees and brush piles also provide cover. Many forest-dwelling animals require a cavity in a dead tree (snag) for nesting. If it’s possible … leave a dead tree or two for the woodpeckers and the flying squirrels. Mother nature recycles everything. Wildlife requires all of the “trash” that people throw away, it is always used by some animal somewhere in the food chain. Consider constructing brush piles with fallen tree limbs and using leaves and grass clippings as mulch. Leave stumps and fallen logs for cover and foraging areas, and, most importantly, refrain from using pesticides. Yaupon hollies and Walter’s viburnum are excellent for nesting sites and providing berries in the winter. There are many native plants that produce berries, and will not only provide food, but cover as well. Beautyberry (Callicarpa americana) is a deciduous shrub that may reach 10 feet in height. It grows in full sun to part shade with dry to average moisture. The bright purple berries are an important winter food for the birds. 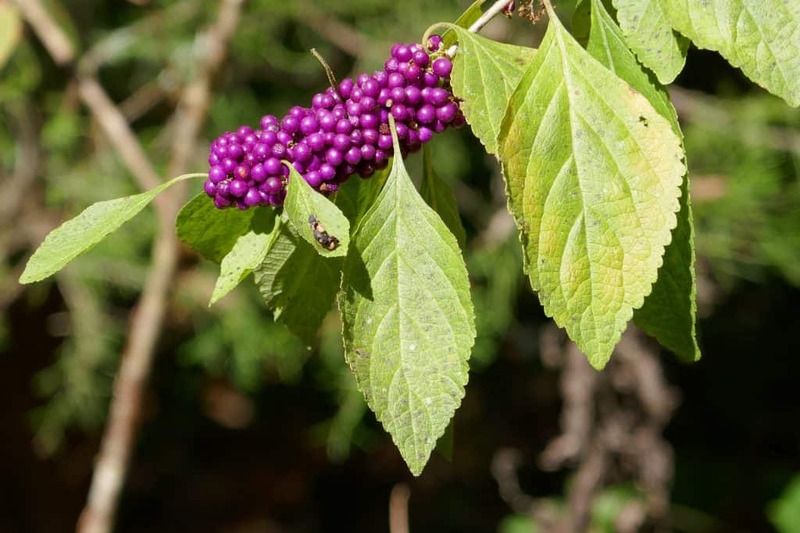 Buy beautyberry seeds here. Dahoon holly (Ilex cassine) is an evergreen tree reaching 40 feet in height. The female has the bright red berries. It grows in full sun to part shade with average to moist soil. The berries are another important food supply for birds. Yaupon holly (Ilex vomitoria) is an evergreen tree which reaches 25 feet in height. Only the female has the bright red berries. It grows in sun to part shade with average to moist soil. It is another important winter food source. 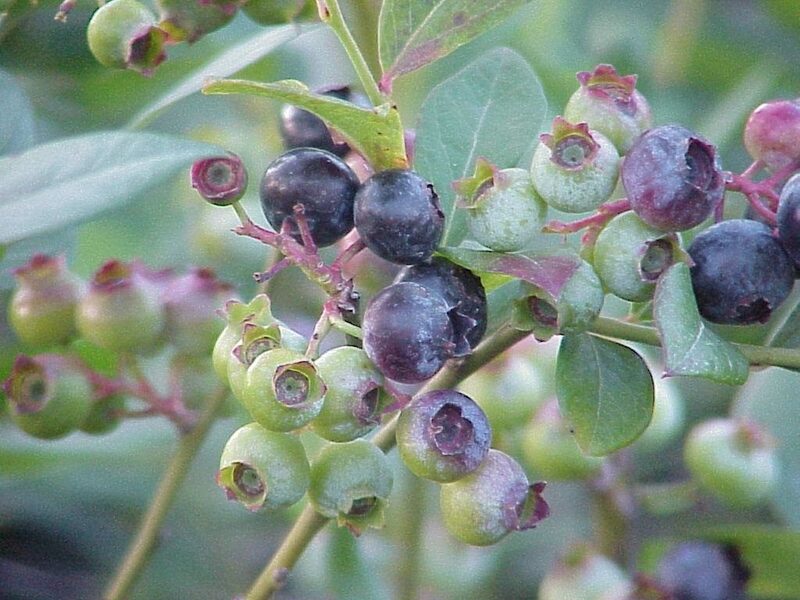 Sparkleberry (Vaccinium arboreum) is a semi-evergreen shrub, and Florida’s largest blueberry. It may reach 20 feet in height. It grows in part-shade with average moisture. The berries are edible, but do not have much flavor and tend to be rather gritty. Walter’s viburnum (Viburnum obovatum) is a semi-evergreen shrub reaching 15 feet in height. It’s small, evergreen leaves make this a good candidate for using as a hedge. It grows in sun to part shade with average to moist soil. The small black berries are relished by birds in the winter. Nectar plants, as well as larval food plants, should be provided in order to have butterflies as constant visitors to your landscape. Dense shrubs will provide cover and protection from the elements, and moist soil or mulch will provide a water source. Butterflies drink from moist soil or droplets rather than an open pond so as not to endanger themselves. 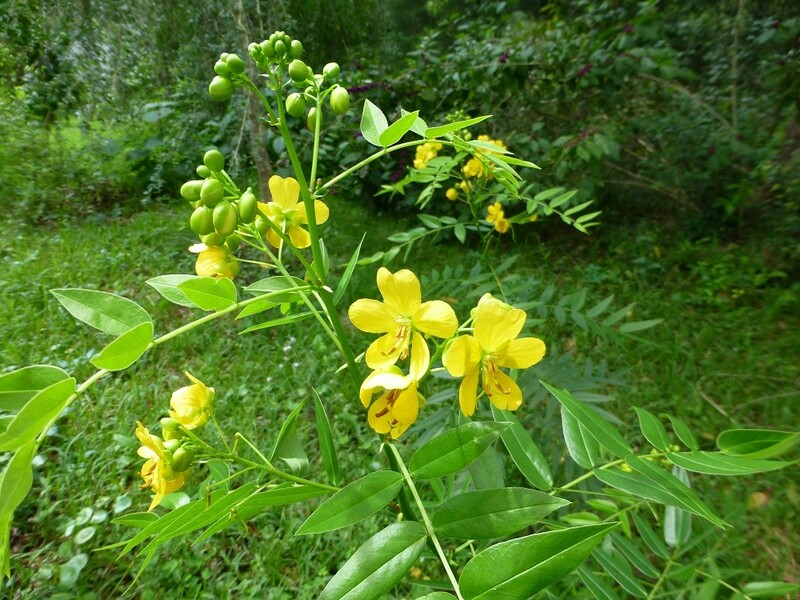 Privet wild sensitive plant (Senna ligustrina) is a deciduous shrub that grows from 4 to 8 feet in height. Bright yellow flowers appear in the fall. It grows in full sun to part shade with average moisture. It is the larval food plant of a number of sulphur butterflies. Buy Senna ligustrina seeds here. Tampa vervain (Glandularia tampensis) is an endangered perennial wildflower that reaches about 2 feet high and grows in sun to part shade with average to moist soil. The flowers are lavender in color. Virginia willow (Itea virginica) is a deciduous shrub reaching 6 feet in height. The small white flowers are born on elongated clusters. It grows in part shade to full sun with average to moist soils, but prefers constant moisture. Black-eyed susan (Rudbeckia hirta) is a perennial wildflower reaching about 2 feet in height. It has bright yellow flowers with black-brown centers. It prefers full sun with average moisture. Buy Rudbeckia hirta seeds here. Wild petunia (Ruellia caroliniensis) is a perennial wildflower that reaches 1 foot in height, and can spread to become a ground cover. It tolerates part shade to full sun with dry to average moisture. It has lavender blooms. Stoke’s aster (Stokesia laevis) is a perennial wildflower reaching 2 feet in height. It tolerates part shade to full sun with average to moist soil. Its lavender flowers are more abundant if grown in full sun. Coral bean (Erythrina herbacea) is a deciduous shrub reaching 15 feet in height. It grows in part shade to full sun with dry to average moisture. 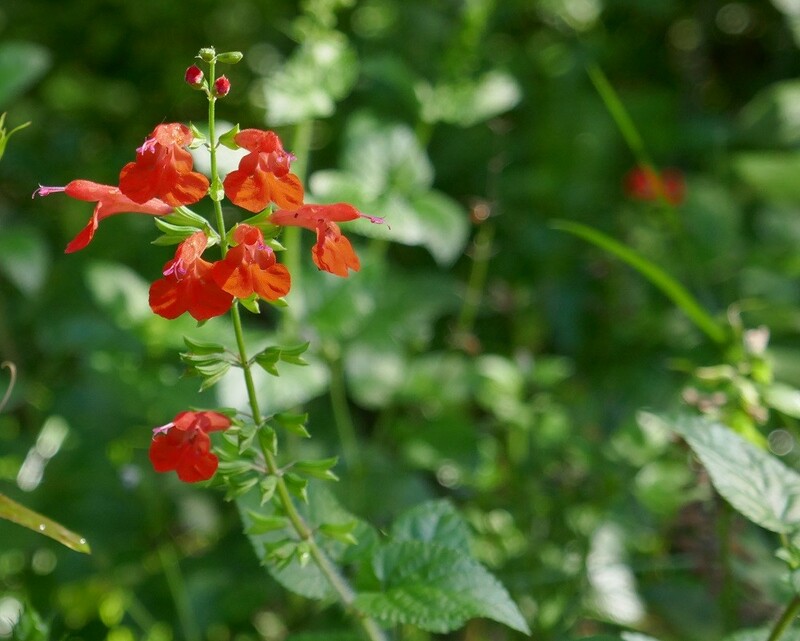 The red tubular flowers are enjoyed by hummingbirds and large butterflies. The seeds are poisonous if eaten. Buy coral bean seeds here. Scarlet hibiscus (Hibiscus coccineus) is a perennial wildflower reaching 10 feet in height. It tolerates part shade to full sun with moist soil. It has large, 6 inch, vivid, red flowers. Coral honeysuckle (Lonicera sempervirens) is an evergreen, perennial vine with red tubular flowers. It tolerates part sun to full sun with average moisture. It flowers best with full sun. Swamp azalea (Rhododendron serrulatum) is a deciduous shrub reaching 15 feet in height. It tolerates shade to part sun with average to moist soil conditions. It has white flowers. Red salvia (Salvia coccinea) is a perennial wildflower that may reach 4 feet in height. It tolerates part shade to full sun with average moisture. The red tubular flowers are used by butterflies and hummingbirds. Buy red salvia seeds here. Raccoons and opossums relish plums and saw palmetto berries. Flying squirrels require cavities in dead or dying trees for nesting and protection. Rabbits prefer thorny, low growing, hedges and brush piles. Bats may sleep alone in trees or together in clumps of Spanish moss and can sometimes be attracted to a roost box if one is provided. Pignut hickory (Carya glabra) is a deciduous tree reaching 70 to 100 feet in height. It will grow in dry to moist soils in part shade to full sun. The nuts are edible, and an important food for wildlife. Squirrels love them. Red mulberry (Morus rubra) is a deciduous tree reaching 50 feet in height. It grows in full sun with average moisture. The edible fruits can be messy so plant it far from the patio. All wildlife relish the fruit. Chickasaw plum (Prunus angustifolia) is a deciduous tree reaching 20 feet in height. The small, 1/2 inch, reddish plums are used by a variety of wildlife. The plums are edible, but sour. It grows in part shade to full sun with average moisture. Highbush blueberry (Vaccinium corymbosum) is an growing evergreen shrub that reachs about 15 feet in height. The berries are edible, and very sweet. It grows in full sun to part shade with average to moist soils. Leaves used as a mulch maintain a moisture level that in some cases is perfect for amphibians to thrive in. Slimy salamanders love moist leaf litter as do frogs and toads. Brush piles, and fallen logs, are ideal foraging and sheltering areas for reptiles and amphibians. Rocks in the landscape provide perfect perches for reptiles to sun themselves and catch insects. Gopher apple (Licania michauxii) is an evergreen ground cover that reaches 3 – 12 inches in height. It requires full sun with average moisture. Gopher tortoises relish the fruit. 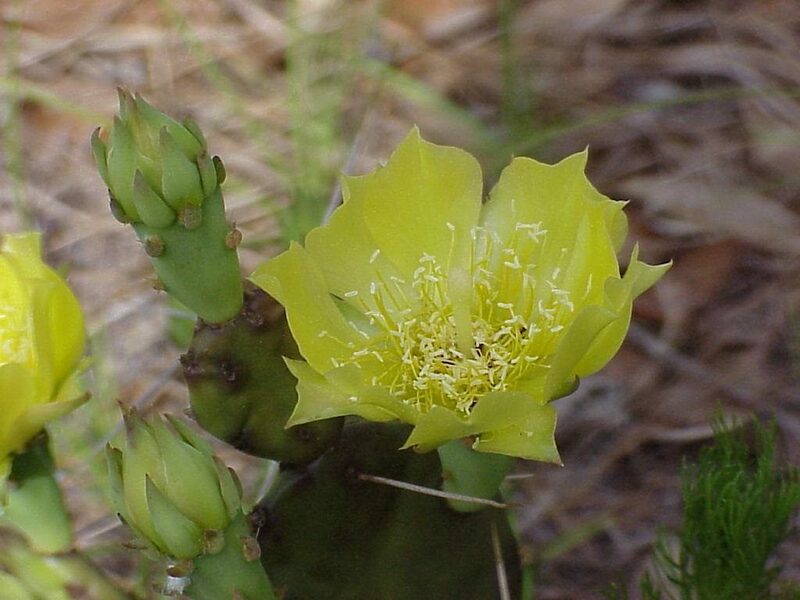 Prickly pear cactus (Opuntia compressa) is a woody, succulent cactus reaching 2 feet in height. The flowers are yellow. Gopher tortoises eat just about every part of this cactus. It prefers full sun with dry soil. Needle palm (Rhapidophyllum hystrix) is an evergreen palm that will reach 6 feet in height. The reddish to purple brown fruits are eaten by mammals and large birds. The trunk has needle-like spines which provide cover for reptiles and amphibians. It tolerates part sun to full sun with average moisture. Saw palmetto (Serenoa repens) is an excellent evergreen ground cover for reptiles and amphibians and can be used underneath trees. This evergreen shrub reaches 8 to 10 feet in height and tolerates both shade and sun. The flowers are used as a nectar source for many insects and the black fruits are eaten by a variety of mammals and birds.